Building a concrete pad can be a difficult task, depending on the size and the location of the installation. Both variables are determined by the purpose of the pad. A concrete pad that will be installed in the backyard and used for recreational and entertaining purposes is planned differently than a concrete pad that will be installed on the side of your house and used to store a motor home. For large projects, it is logistically more convenient to order the concrete needed from a local concrete dealer than it would be to mix the concrete yourself from hundreds of 80-lb. bags. But 80-lb. bags of concrete will work very well for smaller projects. Measure the area where you would like to build the concrete pad using a tape measure. Look the area over, paying close attention to the details of the area. How level is the area? Will you need to do very much excavation to level the ground? Is there any sod that will have to come up? Get a general sense of what the project will require you to do to prepare the area for building. Begin the excavation and leveling of the building area. If a lot of excavation and leveling has to be done, seriously consider renting an earth-moving machine (consult your local tool rental center for their recommendations in dealing with your local soil type) to avoid a lot of serious labor with a shovel and a pick axe. Renting a machine will add to the cost of the project, but it will save you a lot of time, energy and muscle soreness in the end. 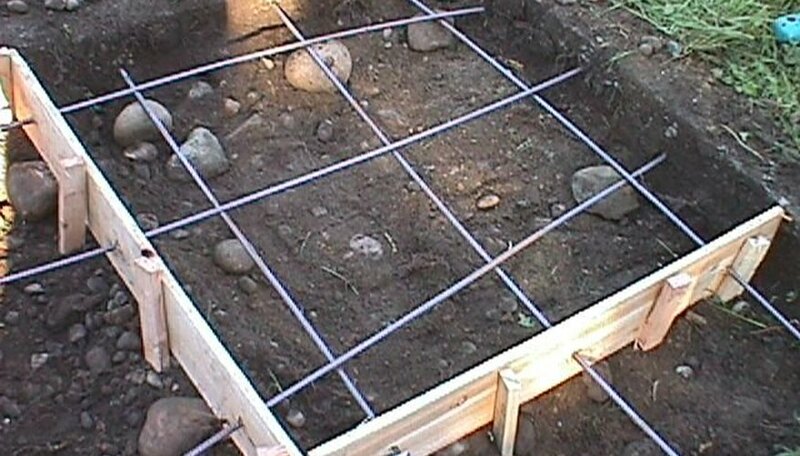 Assemble the outer frame for the concrete form in the dimensions desired for the finished concrete pad using 2-by-4 or 2-by-6 lumber, depending on the desired thickness of the finished pad. After the frame is built, nail or screw wooden stakes to the outer edge of the frame beginning 12 inches from the corners, and then every 2 to 3 feet along the length and width of the form. Put the frame into place with the aid of a helper. Pound the stages into the ground. Level the frame out with the help of a level. Leave enough space between the ground and the bottom edge of the form to accommodate a 2- to 4-inch layer of road base gravel to be put into place between the ground and the concrete pad. Pour a 2- to 4-inch layer of road base gravel over the entire surface of the ground and roughly level the gravel with a shovel. Run a plate compactor over the gravel to help it to settle and to pack it tightly. Mix the concrete with water according to the manufacturer's instructions. Pour concrete mix over the compacted gravel base. Screed the concrete with a straight 2-by-4 so it is level with the forms. Fill in any holes and low spots as you screed. Tap on the sides of the form walls to help work any air bubbles out of the concrete. Allow the concrete mix to set up for a little while. Finish the surface of the concrete by smoothing the surface with a bull float. These can be rented at most tool rental centers. Run a concrete edging tool where the concrete and the form meet to create a finished rounded area for when the forms are removed. For larger concrete pads, use a fresno trowel and a grooving attachment to create grooves in the surface of the concrete. These will act as possible cracking points as the concrete slab ages and settles. Allow the concrete to dry and cure according to the recommendations of the concrete dealer, or according to the recipe instructions you are following.